What is the cure for bunions? How do you treat bunions? How do you treat bunions? How do you treat sesamoiditis? 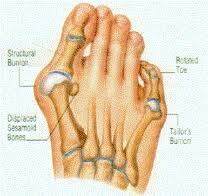 The forces involved in the creation of bunions, sesamoiditis and hallux limitus are very strong, making them difficult conditions to resolve. As a rough guide, in my practice of podiatry, I consider the conditions of sesamoiditis and metatarsalgia to be quite manageable. By this I mean that the pain and disability can be resolved but that the underlying problem remains and pain will probably return if the in-shoe insert is abandoned. Stress fractures are almost entirely preventable if treatment is sought in time. Advancement of the condition Hallux limitus can be paused at the point it has progressed to when treatment starts if you are very diligent in following the recommended treatment. I do not believe that it can be reversed without surgery. Despite this fact, no matter how painful the hallux limitus joint has become, using orthotics to eliminate the pain is usually quite simple and corrective orthopaedic surgery can most times be avoided. For bunions/ HAV, significant reduction and perhaps elimination of the pain you experience within the joint is usually achievable. Unfortunately, bunion joints don’t respond as favourably to long term, preventative orthotic treatment as the other conditions listed above and progression of the condition often can’t be stopped entirely. You might estimate that best preventative treatment can slow the progress of bunions to something like half speed. For example, the growth of the bunion over the next 10 years without treatment might take 20 years to develop with good care. This slow down could well mean the difference between needing joint surgery eventually or not. As alluded to above, the treatment needs to be extremely specific to each person and each foot. One-size-fits-all orthotic inserts from the chemist or shoe shop are not potent enough for these conditions. An orthotic device specifically crafted to the anatomy of your foot for you by a competent podiatrist is essential to getting a benefit. To view this Q&A session about forefoot pain as a single document in downloadable / printable format, please browse to our Bunions Info Sheet. Use this link to return to the Podiatry FAQs list.